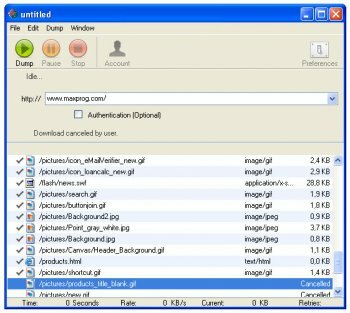 Web Dumper can download entire Websites off of the Internet, and save them on your hard drive for later offline browsing. Downloaded Web sites are saved on your hard drive with their directory structure intact. Web Dumper automatically downloads HTML documents along with their embedded pictures, sounds, movies and so on while it screens them to look for any enclosed links to other documents.